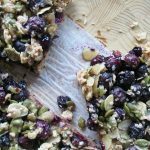 I found this in, ‘Sunday Suppers’, by Karen Mordechai and not only is it tasty for a regular breakfast, but once it’s cool you can choose to snap it into large, ‘snacking’ chunks for a portable granola bar snack instead of breaking it down into ‘cereal’ size. Any shape works great – enjoy! Preheat the oven to 325 and line a large baking sheet with parchment. In a large bowl, whisk together the oil, honey, both sugars, salt and vanilla and then add in the oats and nuts and stir well to combine. Pour the mix onto the prepared baking sheet and pat it down all over into an even, compact layer – this should fill the entire sheet. Bake for 30 to 35 minutes until golden brown – you may wish to rotate the pan once during baking – and then remove the pan from the oven and allow it to sit, untouched, and cool for half an hour. At this point, break the granola up into the size that you prefer, add in the dried fruit and store in an airtight container. 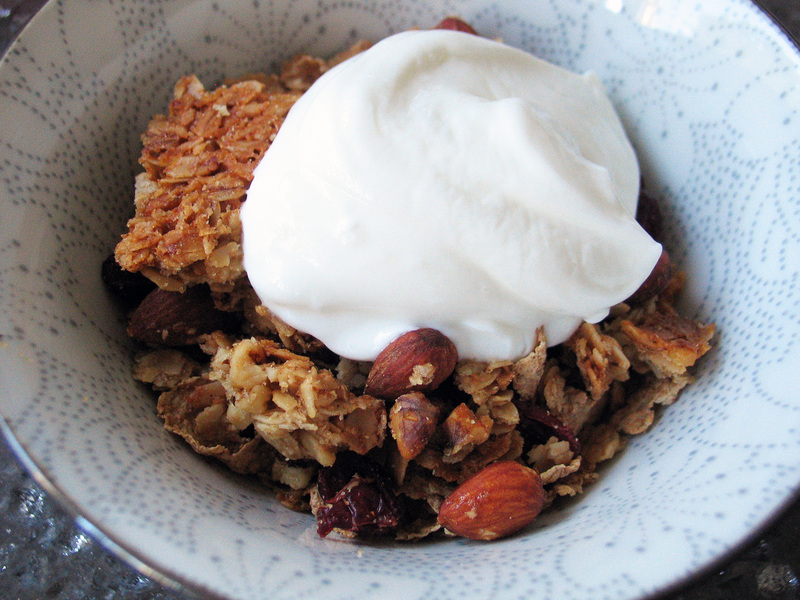 This may be ‘breakfast food’ but it works for us at any time of the day…especially with a spoonful of Greek yogurt!